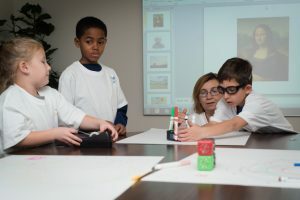 FasTrack Robotics is a fun, innovative program that will change the way children use technology. It is designed for students starting from 5 to 10 years old to provide the easiest way to learn the basics of robotics. In the FasTrack Robotics class, students build with Cubelets. Cubelets are magnetic, robot building blocks, each with a small computer inside, that can be connected in many different ways. Curious creators in FasTrack Robotics use Cubelets to build their robots. Cubelets are an expandable system of robot blocks, that SENSE, THINK and ACT for use by novice and experienced builders. Students’ expand their creativity when they use the included Brick Adapters to connect Cubelets with Lego®. Sunday from 12Noon to 1pm. These are very limited enrollment classes, so please call or email today for an enrollment form.